No, this blog entry is not about a TV series called “Lost”, which featured a guy named Mikhail Bakunin. This is a about a recent event in Moscow, and a sad one. Russia is quite notorious for its disregard for its own past (and official history tends to be re-written every several decades or so). Just recently, in November 2013, as the Putin regime started official celebrations of the 400th anniversary of the Romanov dynasty, Moscow lost one of its historical monuments under the guise of “restoration”. 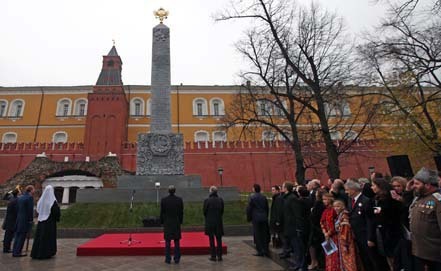 The monument – originally erected for the 300th anniversary of the Romanovs’ rule in Russia in 1914 and later subject to a detournement by the Bolshevik government as part of the latter’s “monumental propaganda plan” – bore the names of various non-Bolshevik socialist revolutionaries from Gerard Winstanley through to Georgy Plekhanov. In fact, it appears that apart from the grave stone in Bern, this had probably been the only monument to Bakunin (not that the famous anarchist cared for monuments). Right after the monument was dismantled “for further restoration” in June 2013 a public campaign was launched for its preservation, as people had reasons to believe that the results of “restoration” might be really bad (as it happens with “restoration” of many historical buildings in Moscow these days). Moscow anarchists and socialists also launched an educational campaign of their own by reading public lectures on the spot of the monument, which were devoted to socialist thinkers and revolutionaries, whose names were inscribed on the monument since 1918. Vlad Tupikin, a long-time anarchist, read a public lecture on Bakunin as well. But it appears that the public campaign for salvation of the monument was not active enough and it was no surprise that in November 2013 Muscovites were presented with the results of “restoration” that had to be expected – the names of revolutionaries were gone and the monument was changed back to its royal style. However, as it turns out, this was no restoration at all, as the monument only vaguely resembles its 1914 original. The Kremlin restorers couldn’t resist the temptation to make the monument look more pompous and glamourous. “The main issue for estimating what has happened to the monument is not the quality of “restoration”, not the size and form of the types used, not orthographic mistakes in the text, not how the monument corresponds to the historical photographs [of the original]. It is the general essence of the “restoration” and the way it was implemented that is of principal importance here. 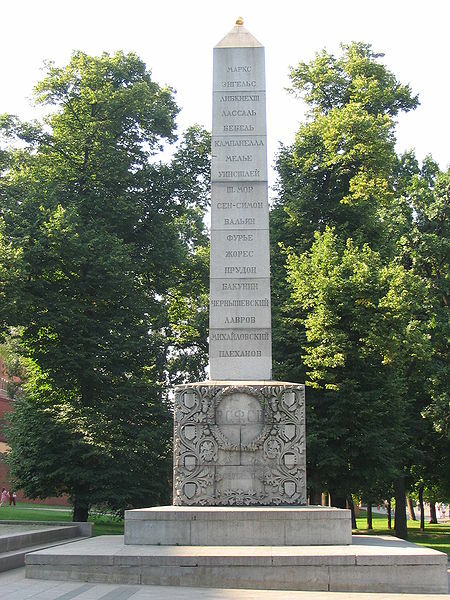 As it is well known, “the memorial of the 300th anniversary of Romanov dynasty’s Tsardom”, which was inaugurated in 1914, was turned by the new Bolshevik authorities into the monument “commemorating thinkers and activists for the cause of liberation of the working classes” in 1918 and the names and symbols on the monument were correspondingly changed. The vandalism of 1918 cannot be supported, but the “restoration of historical justice” in 2013 by means of simple change of names and texts back to what it was before resulted in yet another vandalism. Historical monuments cannot be treated like convenient posters advertising these or those values. Their value is of a different kind: they preserve the traces of history, which are embedded into the memory of several generations of our compatriots, including people living now. The monument in its 1918 version was one of the very few authentic objects of the so called “Plan of monumental propaganda” during the first years of the Soviet power, which was still present in the streets of Moscow. More recent layers [those of 1918] on the monument had a historical value of their own. Radical “restoration” of such a significant, well-known monument open to the public in the urban space was done without any open and professional discussion of its idea and implementation. The country and the city were just presented with the fact of such a “restoration”, which was authorized by the Russian Ministry of culture. Probably one of the best solutions as part of the celebrations of the 400th anniversary of the Romanovs would be to erect a whole new monument in Aleksandrovky garden based on the 1914 original, while the existing monument could be transported to one of the city museums. However, the absence of a procedure for proper expertise and public discussion made it impossible to choose the best among different variants.